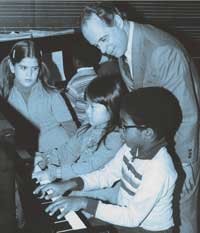 BACKGROUND TO THE PACE APPROACH: The basic concepts of the RobertPace Keyboard Approach began to take shape in the mid-twentieth century when Robert Pace, as a young concert artist-teacher, established his own laboratory piano studio to teach and analyze the progress of students from pre-school through the senior years. Based on these teaching experiences, he became convinced that music study (particularly piano study), should have a very positive effect on our lives and help us become better human beings. It was obvious to him that, while music was not a universal language, it was a universal means of expression with many dialects that had been manifest in the various civilizations over the centuries. However, he was deeply concerned that so few had anything significant to show for their efforts after years of music instruction. There has been the misconception that the piano is a difficult-to-learn instrument, therefore, only a few extremely gifted individuals will ever be able to play it acceptably. Unfortunately, rote learning, which produces limited understanding and accumulation of knowledge, only fuels the problem. According to Dr. Pace, the piano is the ideal learning instrument to let most people acquire musical knowledge and skill, since it uses the three educational senses of sight, touch and hearing to deal with the three basic elements of music--rhythm, melody, and harmony. In addition, a keyboard instrument can produce higher and lower sounds than any other single instrument, and thanks to today's technology, a limitless variety of effects. While Dr. Pace saw the potential of this instrument for developing musical literacy and creativity, he also realized that teachers needed new materials with appropriate skills in order to get music into the everyday lives of people. 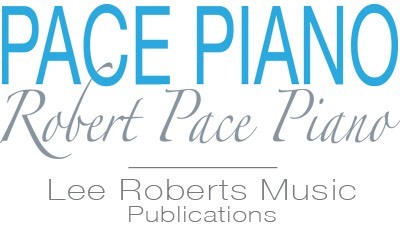 Two basic elements of the Robert Pace Keyboard Approach are the development of functional musical literacy (good sight-reading skills), and the nurturing of one's ability to do creative problem solving (improvisational skills). His concern was that students must develop adequate reading skills from the outset in order to be musically "self-reliant" at each level, and to enjoy the endless variety of music that is available. Those students with good working "processes" are capable of turning out more and better "products," since they work more efficiently with greater comprehension. Therefore he rejected the temptation of allowing students to "rote-memorize" flashy recital pieces, which were beyond their reading level, and could be learned only after much tutoring from the teacher. In his early teaching, Dr. Pace noticed that students often tried to play everything "by ear" because they lacked adequate reading skills. He also observed that while some students read music rather well, they were without improvisational skills and the ability to create their own music. In the Pace philosophy, however, improvisation was complimentary to the acquisition of good reading skills, and vice versa. He insisted on developing "the eye that hears and the ear that sees," which enabled students to conceptualize musical ideas in their minds in the processes of both reading and creating music.